One bookcase stands in my kitchen, holding the cookbooks that most often provide recipes that I actually cook. In the living room and dining room I keep my cookbooks and food history books that less often supply actual recipes. And up in the attic: books I don't like and don't use. Also in the kitchen bookcase is my old, retro, file box with alphabet tabs for recipes and a random collection of cards and a few menus from restaurants where I've eaten. a reunion with former Fulbright Fellows in 1996. Our next reunion is now in the planning stages. 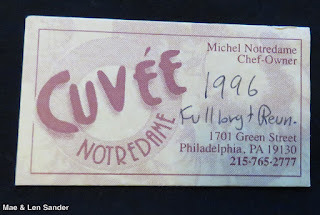 I admit that I've never kept very careful tasting notes when it comes to restaurant food, and there's really almost no information added by hand to the restaurant cards. I sometimes added a date when I was really being systematic; very rarely I noted what we ate. 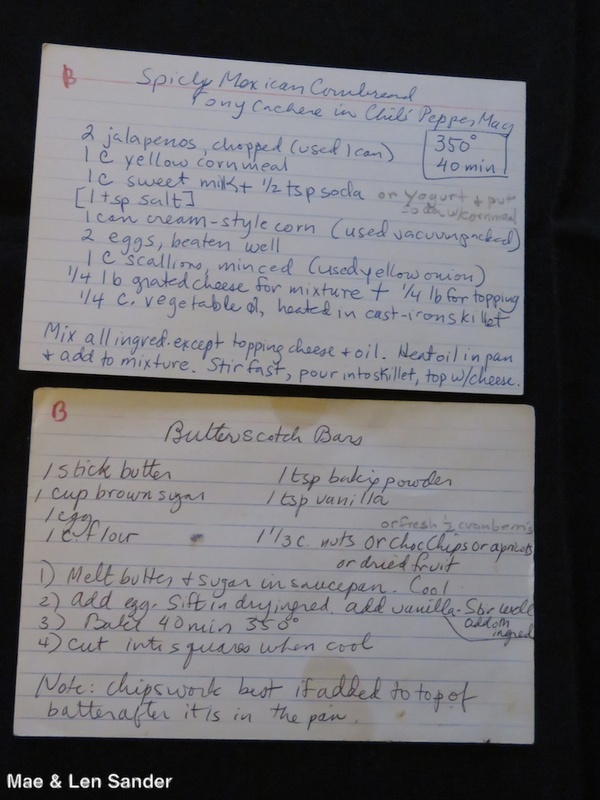 Recipe cards for Spicy Mexican Cornbread and my absolute favorite Butterscotch Bars. Although I've entered all the recipes into my computer files, I still use the cards occasionally. Left: old notes for Daube de Cotignac, a recipe by my friend Michelle who had a house near the town in southern France. 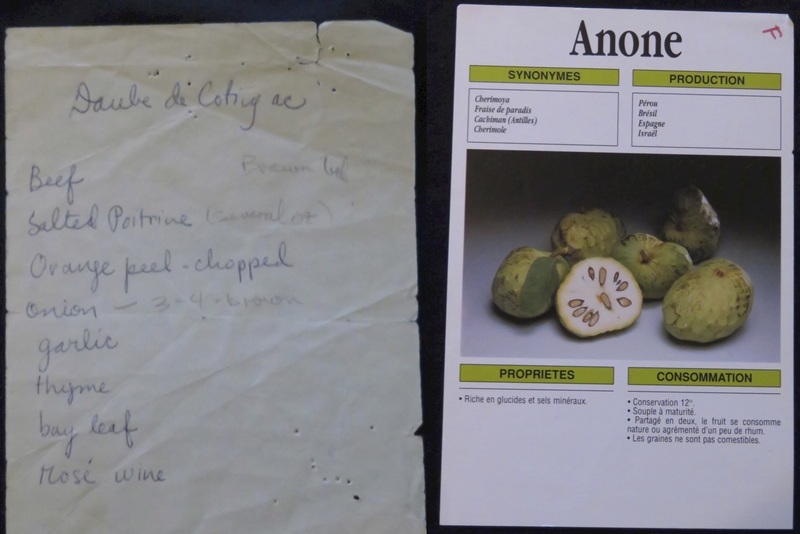 Right: one of several information cards from our local supermarket in Paris explaining unusual fruits and vegetables. A few of the many restaurant cards from our visits to France. Some of these establishments are still in business; many aren't. 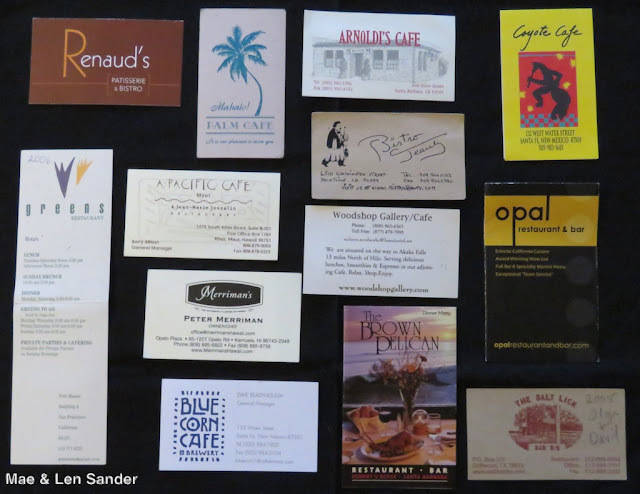 A selection from the many cards from restaurants in California, Hawaii, and other Western states. 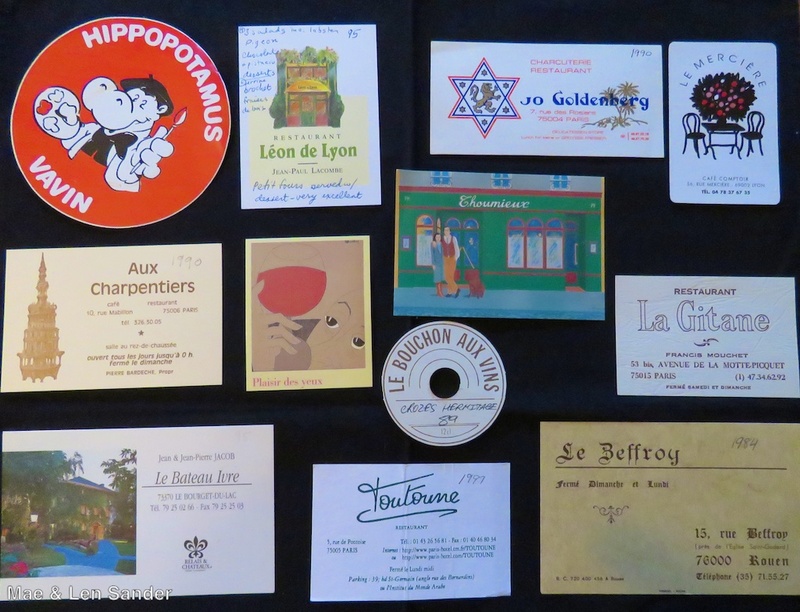 I also have cards from many other European countries, from Hong Kong, Japan, New Zealand, and other US states. 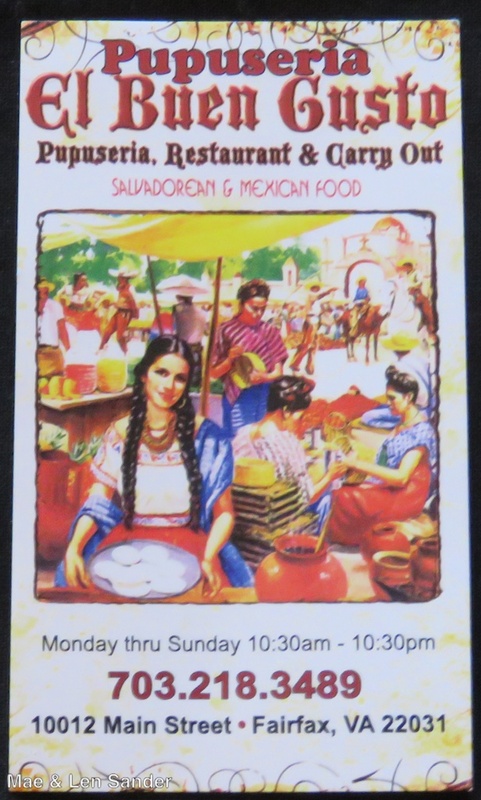 pupusas and tamales in Fairfax Saturday. Cherry Blossom Festival that I attended last weekend. I've become an avid participant at the blogger event "In My Kitchen." This is my entry for the month, with thanks to Maureen for hosting the event on her blog. I do have a few menus but I don't have very many restaurant cards. Yours are Fabulous! How lovely to go through an old treasured recipe box like that. We know the fruit in the picture from Paris as custard apples. Looks like a lovely horde! I especially love that pretty fridge magnet! I love all the old hand written recipes, wont be the same in 30 years when the kids find a computer print out sheet! 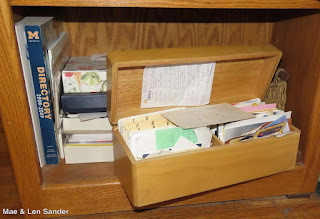 Its fun to look through these memory boxes. I keep shoes boxes of memories and business cards from travels. I like looking through the boxes from time to time. Recipes arent really my thing, but a girl friend gave me a homemade book to store favourite recipes when i was first married, and I've got favourites from 20yrs ago. Great memories!! This is a wonderful collection! A combo of memories and grand tastings and good recipes! Big smiles! I love ephemera; loved everything about this post! Where to start? 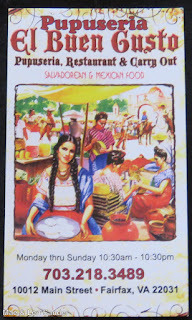 Such fun glimpsing your culinary adventures around the world and in your kitchen. 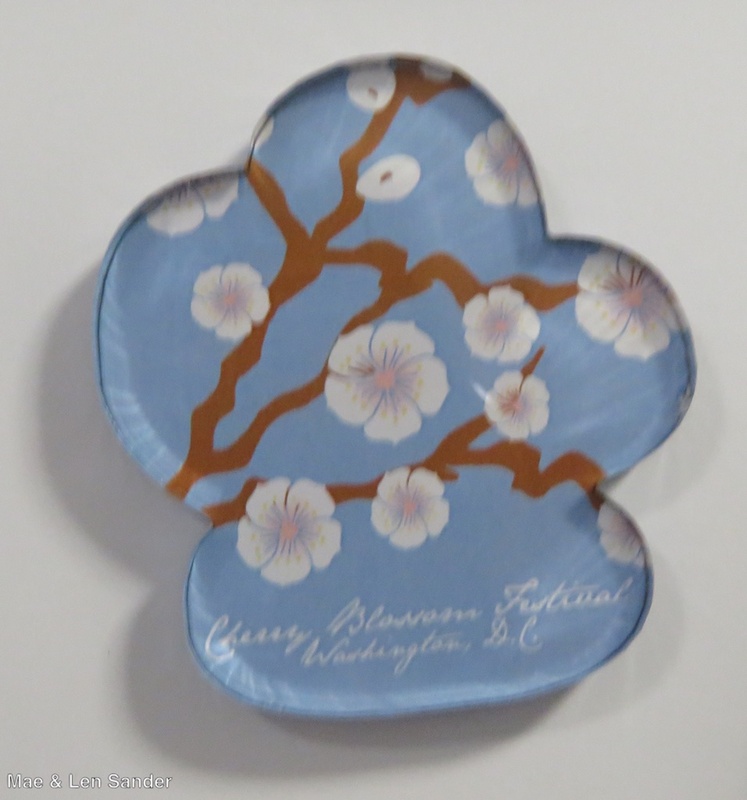 Love that cherry blossom magnet..Coveting it in fact! And grateful and happy to receive your butterscotch bars recipe. Yummy! P.s. Very impressed about your Fulbright scholarship involvement. What a great collection! I love the handwritten cards the most, the more time worn, the better. That Mexican Cornbread, by the way, looks yummy. Like you, I have far too many cookbooks as well as food magazines but still can't part with them. Such lovely treasures. Hand written recipes are becoming a things of the last and I treasure mine. My cookbooks are all together and I'm trying to start using some of the neglected ones more. What do elves and fairies eat?